Sweet Chestnut is a seasonal Superfood. The Sweet Chestnuts a culinary necessity in the cold season. Sweet Chestnuts reduce the stress level. Sweet chestnuts offer top protection with vitamins. The sweet chestnut is base-rich and stomach-friendly. Sweet chestnuts strengthen the bones. The fruits of the sweet chestnut tree are rich in protein, minerals, and vitamins of the B group. People with celiac disease can tolerate their flour; you can use it as a grain substitute. Also, Chestnuts contain only two grams of fat at 100 grams. By comparison, peanuts have almost 50 grams of fat. Originally from Asia Minor or the Caucasus came the chestnut ( Castanea sativa), spread in the course of the expansion of the Romans gradually throughout Europe and later to America. America had his variety, Castanea dentata, long before immigrants brought their varieties. But today most chestnuts consumed in America come from other parts of the world. Sweet chestnuts are nuts and served until the triumph of the potato as a staple food for a broad population, especially in southern Europe. We can harvest the chestnuts between September and October. Long before potato and corn were able to gain a foothold in Europe, sweet chestnut was considered a staple food for a broad part of the population. The sweet chestnut the people processed into flour, from which they baked bread. People called the chestnut the “bread of the poor,” and one chestnut tree per person would be enough to get through the winter. From this, one can already guess which multi-talent hides behind the chestnut. Chestnut makes a filling, wholesome and healthy diet. A big advantage is the high proportion of complex carbohydrates. 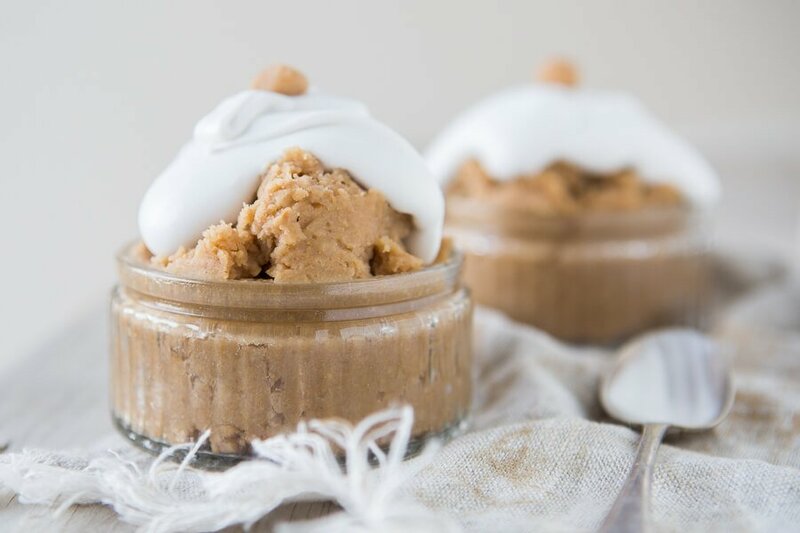 They not only cause a high degree of saturation but also ensure that the blood sugar rises slowly after eating chestnut dishes and remains stable for a relatively long time. We stay longer satisfied. Most people, especially in Europe, only know Maroni roasted in the small brown paper bag from the Christmas market. Delicious, but just one of many ways to enjoy chestnuts. Sweet or savory, as soup, garnish or sweet crème. The nutty-sweet aroma can be so well combined and modified. You can go on and almost always a successful dish comes out. Sweet chestnuts are not only a culinary necessity in the cold season. 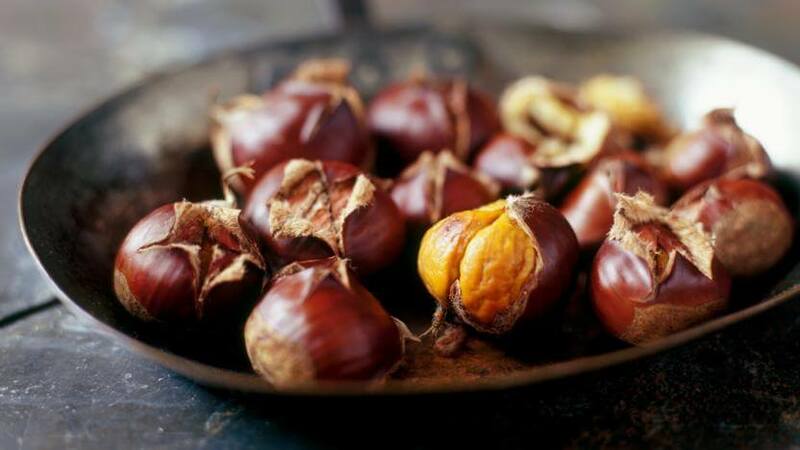 Thanks to their valuable nutrients such as vitamins C, E, B1, B2 B6, potassium, magnesium and folic acid, chestnuts strengthen our immune system, they last long due to their high fiber content and provide plenty of power for the day. Chestnuts not only help you to strengthen your nerves, but they also work wonders of physical and mental fatigue. Responsible for this is the considerable proportion of B vitamins, like B1, B2, B3, and B6. B vitamins are needed especially for the nervous system, but also for an energy balance it is powerful. Even if the B-vitamin content is higher in other nut sorts, it still helps the daily needs of an adult. So if you have a lot of brain work to do, which requires a high and permanent level of concentration, then get yourself a little bag of roasted chestnuts ready. In addition to the B vitamins, the sweet chestnut provides high levels of vitamin C compared to other staple foods, like cereals, potatoes, soya, or lentils. Of course, certain fruits and vegetables, for example, citrus, spinach or broccoli, contain comparatively more of it. But not everyone likes the taste, and now has a good alternative with the chestnut. With its vitamin C content, sweet chestnut is a real booster for our immune system and supports us in warding off infections and inflammation. But not only the immune system benefits from the sweet chestnut. According to studies, a high vitamin C content may reduce the risk of strokes, atherosclerosis, and cardiovascular disease. Finally, it lowers both total cholesterol and bad LDL cholesterol. Together with vitamin E, which is also in the chestnut, vitamin C also acts as an “antioxidant” against attacking free radicals, which not only age our skin but also damage our body cells. A process which may ultimately promote the development of cancer. With consumption of chestnut, a potassium-rich, over-abundant diet, you also can make an end for specific ailments in the gastrointestinal area. Flatulence, heartburn, bloating or irritation of the gastric mucosa, which are signs of an overloaded digestive system. The high potassium content of sweet chestnut contributes to bone health, as high potassium levels lead to decreased calcium excretion. Thus, more calcium remained in the organism and stored in the bones. If you are going to consume the chestnuts like people in Europe at the Christmas markets, scrape them crosswise and put them in the oven for about 20 minutes at the highest level. The sweet chestnuts are also suitable for Kids, and the mild-nutty taste is particularly popular with many small gourmets. It is best to cook the chestnuts as a puree. If you are looking for to add a little extra excitement to your dessert tray, look no further. 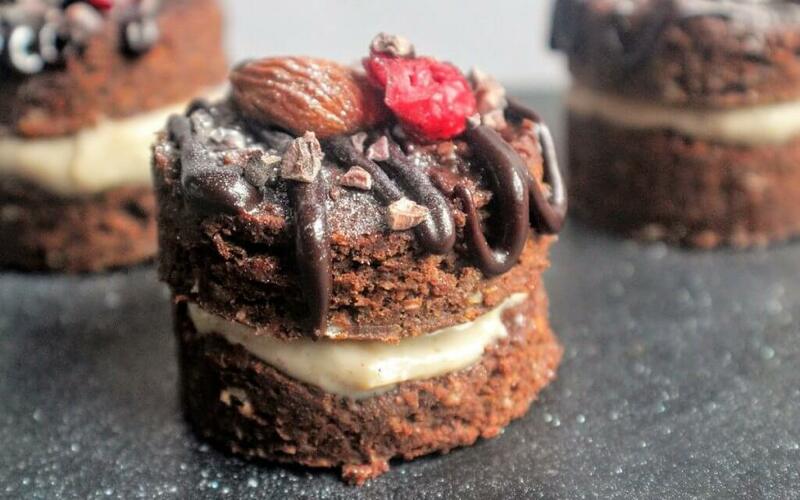 These Mini Chocolate and Chestnut Stacks are the perfect bite-sized dessert are as tasty as they are impressive. The rich chocolate cake sandwiches the delicate homemade chestnut cream in an elegantly delicious treat. This Creamy Vegan Pumpkin Chestnut Pasta is probably the most delicious pasta dish I’ve made in a long time, maybe ever?! Big statement I know. 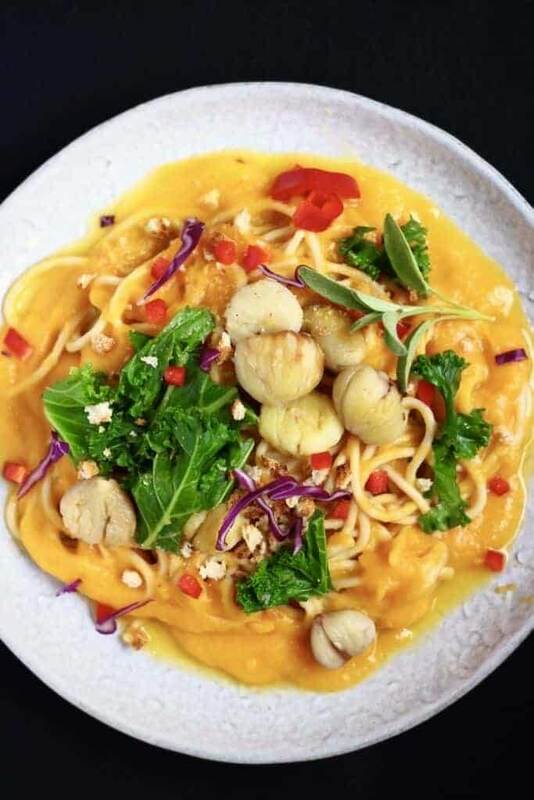 But seriously, I’ve made a lot of creamy vegan pasta dishes, so I have plenty with which to compare this Creamy Vegan Pumpkin Chestnut Pasta. 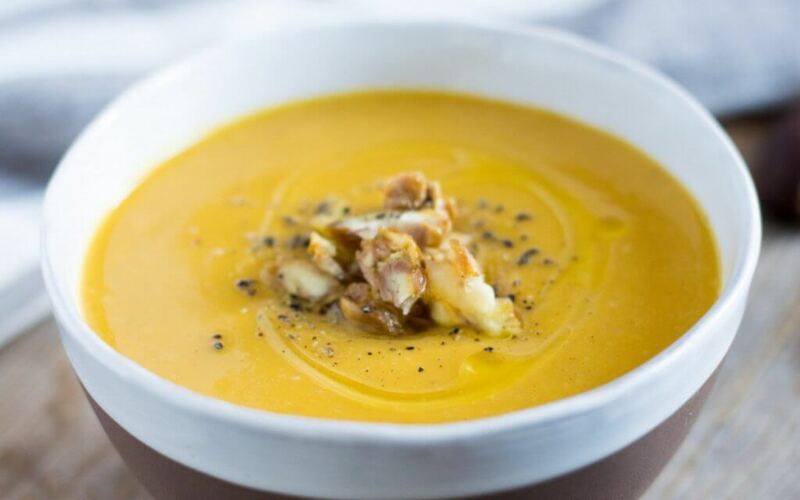 Roasted butternut squash and chestnuts topped with freshly ground black pepper and a drizzle of extra virgin olive oil make this creamy soup the perfect holiday appetizer. Try this Cream of Roasted Butternut Squash and Chestnuts and feel all the comforts of the season. Chestnuts would have to be one of my all-time favourites foods. I love them roasted, pureed, in any which way. I like to keep them simple as they are just divine on their own. And I know that a lot of people in Australia have never tried chestnuts, but where I grew up (Slovenia), I have many fond memories of them. 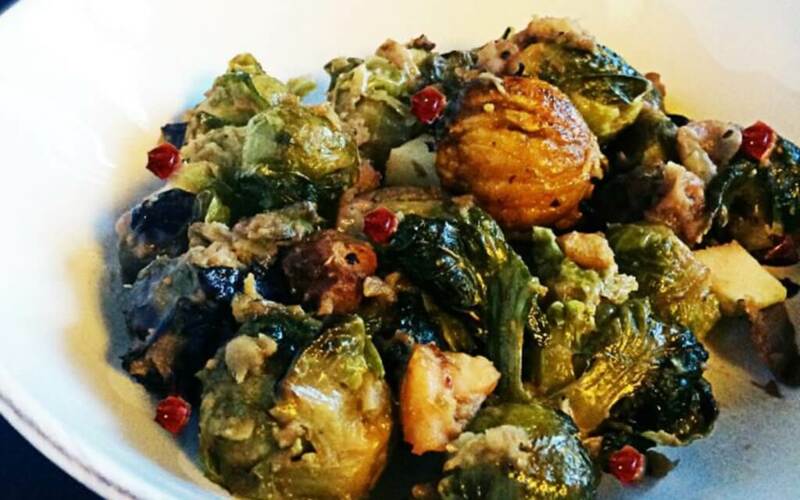 It’s that time of year for Roasted Brussels Sprouts With Apples and Chestnuts! If you aren’t sure if you like Brussels sprouts, give them a try this year. Despite their reputation, they actually have a pretty mild flavor when roasted. If you are trying to convince your kids to try them, remind them they are mini cabbages made bite-size just for them. And pretty cute too! Make sure you make this on a cookie sheet for maximizing your crispiness efforts. Packed with wintery flavors, these Hazelnut Burgers With Chestnut Sauce are a real treat. They are made from potatoes, oats, and hazelnuts so they’ll fill you up and they’re served with tangy sautéed red cabbage and a rich chestnut cream sauce. Like all burgers, these go great with a side of crispy fries. This Maple Parsnip and Chestnut Wellington is a centerpiece worthy of any party. Wrapped in a puff pastry, maple syrup takes the natural, subtle sweetness of roasted vegetables to the next level. 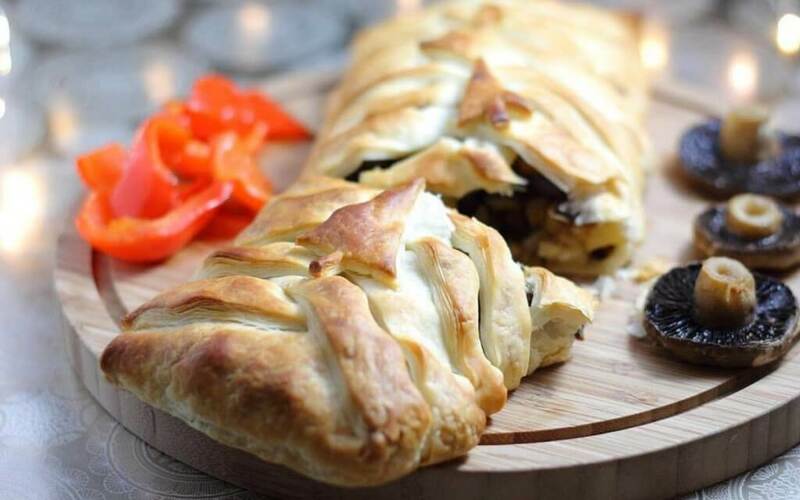 Serve this wellington alongside roasted mushrooms and red peppers for a real feast! 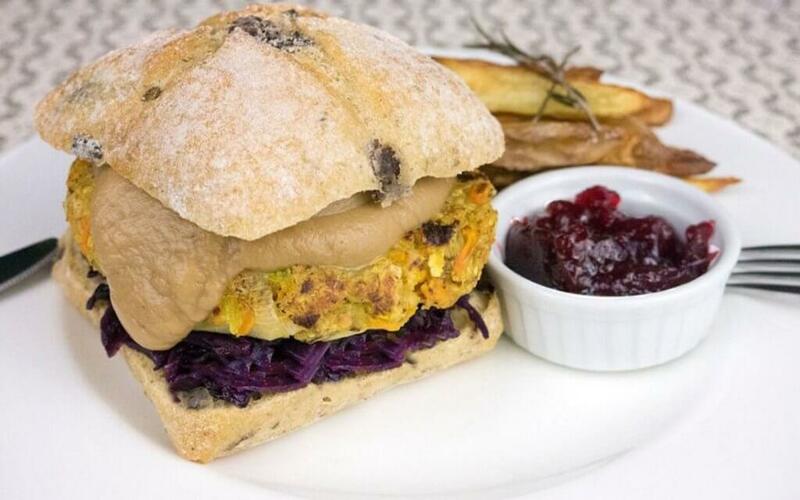 Like To Try A Vegan Ayurvedic Thanksgiving Menu ? Would You Love Vegan Latke Recipes for Hanukkah ?